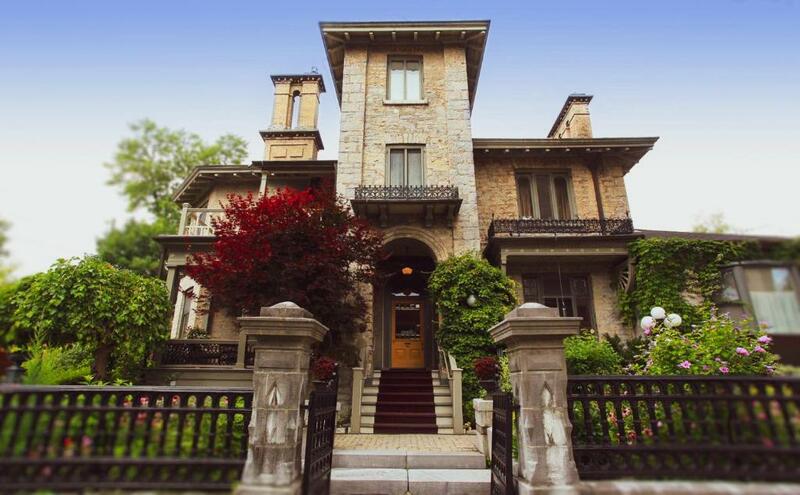 Lock in a great price for Rosemount Inn – rated 9.3 by recent guests! We stayed in the coach house, which was a wonderful suite equipped with a fireplace, small fridge and loft bedroom. We didn’t want to leave. The bed was extremely comfortable and the staff very helpful about happenings in town. Breakfast food was exceptionally good!!! loved the atmosphere and the comforts of the bed and sitting room. The location was convenient. Everything about this place was amazing! Can't wait to come back again. Warm welcome and service, amazing breakfasts, great location, beautiful room, cachet. Afternoon tea and coffee in the parlor. A lovely place to relax. the Chef's breakfast was a nice treat. They make your stay special. Beautiful, comfy bed, fireplace, great breakfast, excellent host! There was tea and cookies available in the beautiful historic sitting room upon our arrival. The breakfast was delicious and was specially planned with a Halloween theme. We were very interested in the mechanism for the antique sliding shutters in our room. The staff was welcoming and we enjoyed chatting at breakfast with guests from France. Gary is the ultimate innkeeper! Breakfasts were fantastic, the inn is beautifully maintained and the neighborhood is very convenient to the downtown district. One of our best sellers in Kingston! Less than 10 minutes' walk from the shops and restaurants of downtown Kingston, Rosemount Inn & Spa offers free WiFi. Built in 1849, this historic inn is housed in a designated building. Each well-appointed guest room is air conditioned and provides ample natural light and WiFi access. The private bathroom includes complimentary toiletries and a hairdryer. Select rooms contain a fireplace while the two-level suite also features a TV. A chef-prepared breakfast is available. Dietary restrictions can be accommodated but guests are kindly asked to inform the property in advance. Guests at Rosemount Inn can enjoy relaxing in the private garden or guest lounge. The on-site spa offers massages, facials and wraps. Guests need to book their appointment in advance with the property. Rousemount Inn is 10 minutes' walk from Queen's University campus. When would you like to stay at Rosemount Inn? Boasting a gas or electric fireplace for the winter season and a porch for the summer season, this air-conditioned room also includes a desk, a radio and a telephone. The private bathroom offers complimentary toiletries and a hairdryer. Free WiFi is included. Maximum occupancy is 2 adults. House Rules Rosemount Inn takes special requests – add in the next step! Debit card Rosemount Inn accepts these cards and reserves the right to temporarily hold an amount prior to arrival. Rosemount Inn accepts these cards and reserves the right to temporarily hold an amount prior to arrival. Please note that guests must contact the property in advance directly to book a spa appointment. Check-in times are only from 16:00 to 21:00 unless prior arrangement with the property has been made. There was a small issue with the parking (due to the contractors working on the renovations) but it was quickly resolved. The Coach House Studio Room was beautiful, clean, and quiet. It was a great place to stay because we were able to walk to everything downtown. I would love to come back and check out the main house once the renovations are complete. The owners are fantastic hosts. They were helpful with tips for Kingston. In an unrelated event, we were just engaged and they tried to make our stay extra special because of it. I wish them success. Fantastic BnB with a friendly and very supportive host. Excellent breakfast. Great experience. The room was large and bright and Holly, our hostess, was very friendly and accommodating. We were welcomed with hot tea and fresh baked cookies and a lot of helpful advice on what to see in Kingston and where to have dinner. Breakfast was indeed also very nice. The room was very warm and the windows didn't open so sleeping was uncomfortable. I also missed having a television available. Parking was difficult because of narrow driveway Street parking was limited becuase of parking ban during the day on the weekdays. My husband would have preferred to sit alone for breakfast rather than family style. Nice to meet new people but it became idle chit chat for people we will never meet again. No fault of yours .... it is something he doesn't care about. Situation, large traditional room, delicious breakfast, welcoming. Lived up to it’s reputation. Beautiful Inn! Amazing gourmet breakfast. Cozy and inviting. Breakfast was amazing! Room was so comfortable. Sounds a little silly, but there were no grab bars in the shower. I'm a bit clumsy and tripped over my own feet and realized there was nothing to hold onto to steady myself. All good, but maybe a good idea? Maybe more info on the cool history in the room? I'd like to know more about the ghost too as it's part of the haunted walks. The internet is good, but I did have some problems downloading a document....could have been me though and not the internet. Lovely B & B with real period charm. Very comfortable sleep, quiet and relaxing. I can see how some people might not be so impressed as with older buildings there are limits - for instance a/c would be tough to install. They do provide a window a/c in the rooms to make up for it. Super clean - very impressive. Large room. Safe. The staff are fantastic! The manager even said that if your having a hard time sleeping they will do everything they can to help. Wonderful custom breakfast - (vegan) and lots of hot coffee. You get to eat with other guests which is very nice as you meet other people. I loved it - but knew I'd be staying in an older building. Beautiful garden - not too sure if you can sit out in the garden? I wasn't there long enough. The staff work really hard, so you have a nice visit and it's very apparent. Holly was great. She was very informative about the City and offered great advice to us as to where to eat,passes for different venues. Our breakfast was very tasty both mornings and enough so we were quite satisfied. This was our first time staying at a bed and breakfast and if the others are as warm and inviting, we will be sure to try this type of accommodation again. No TV, very poor or none existent WI Fi . AC window very loud.